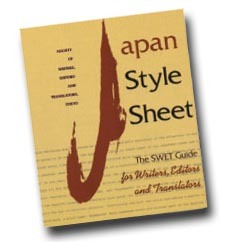 SWET-L, the open mailing list for SWET and people interested in matters of concern to professional writers, editors, and translators, is an ever-reliable source of helpful and timely advice, keeping listers abreast of new crinkles in English. This installment of the events on SWET-L brings us up to the end of 2010. Here you will learn how SWET-L listers, affronted by self-righteous clients or cast into deep dungeon by habit, rein in the ever-gamboling English. The list was as usual helpfully supportive, bringing good cheer to stranded wordsmiths. In a thread elicited by an article seen on Glendale News-Press back in September of 2010 a lister noted that the new 16th edition of The Chicago Manual of Style recommends dropping the capital “W” in “Web” and making it just plain “web.” The list resounded with “I told you so’s.” This was bound to happen, newfangled terms first testing the waters as proper nouns, then becoming old hat and going straight with lower case. The commonly observed progression of neologisms that arrive as multiple words, evolve to the hyphenated stage, and as we get used to them, advance into common-noun regularity is now quite familiar. Listers registered their continuing attachment to the e-mail hyphen, perhaps hoping to brake or deflect the evolution to email or the unadorned mail (from the vernacular メール). No anxious rushing to change—SWET-L listers seem to take the cautious approach in what they say and do. Then there was the plea for help from an unfortunate lister whose client had called for all manner of punctuation and hyphen usage that seemed to go against everything he assumed was right. 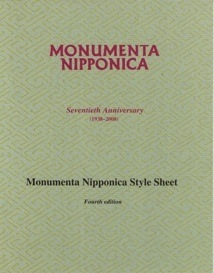 The list suggested sticking to the standard references in the Chicago Manual of Style or Webster’s 11th Collegiate Dictionary, not to mention SWET’s Japan Style Sheet (or the Monumenta Nipponica style sheet, available online). Still, there will be clients who have strong preferences of their own, and for those it may be helpful to create a client-specific or even job-specific style sheet to establish what is expected and be able to respond in a coordinated manner. Such style sheets entail extra work at the beginning, but can be brief, and also help to clear the head when overworked and multi-tasking on several jobs. The SWET Newsletter Style Sheet, at your fingertips on the SWET website, can provide a useful model to start from. A useful distinction for graphics noted in a related thread reminded us that the titles of paintings are italicized but photographs get quotation marks, at least according to Chicago’s 15th edition. For punctuation with captions, the 15th edition says, “No punctuation is needed after a caption consisting solely of an incomplete sentence. If one or more full sentences follow it, each (including the opening phrase) has closing punctuation.” Clients have been known to push for different and inconsistent usages. Again, a job-specific style sheet, worked out with your client, may come to your rescue. A lister had met a client who wanted “both . . . and” in a negative context (like “no difference in both . . . and . . . ”) and the lister had lost nerve: would the list be in support of this not really being English? Yes, and Michael Swan’s Practical English Usage has the gravitas to carry the day. There is an equally authoritative Japanese grammar the Royal English Grammar with Complete Examples of Usage (ロイヤル英文法—徹底例解) from Obunsha, equally effective to put “futile” arguments to rest, as the post had it. A lister was casting about for a solid-ground applicable equivalent for maritime. The advice was to use land, but the starter of the thread went with terrestrial. There is of course the context to consider, but Wikipedia has maritime with land. As a comment pointed out, “maritime” implies human activity on oceans and seas, whereas “terrestrial” refers to location and doesn’t seem to imply human activity: it is static, it refers to a state. The watery equivalent of terrestrial would be aquatic. A lister was floored by the two adjectival forms: automotive and automobile. When to use which? Apparently even people who should be in the know use the two interchangeably, but the list was asked to ponder the (idiosyncratically proffered) distinction that automotive, by definition, refers to all motor vehicles; and that automobile refers to passenger vehicles (cars, trucks). And we were alerted to the fra.proz.com site busily out there helping translators, and specifically having had a discussion of the two terms here. The list noted the October 2010 interview via e-mail of Jay Rubin, one of Murakami Haruki’s translators, at the Asahi Shinbun, who hints at his work habits and mentions how he deals with translating “back” Murakami’s English-influenced style. Then in the line of writing that is thoughtful, expansive, and relevant to translation input, we recommend writer Julian Barnes’s recent comparison of Madame Bovary translations in the London Review. The list was alerted to “Copy Editing,” a for-money web-zine (they will send you a sample issue for free, though) that could be a must for SWET types to add to the pile of reading waiting to get processed. And do not forget TECHwr-L.com, where all is open and free, massive and well organized, and of course we have the Honyaku E<>J translation list. In Japan the cosmetics industry speaks of “base” and “point” makeup, but how does that fly in English, a thread asked. Well, base makeup was, and in many places still is, called foundation. What in Japan is “point makeup” is the stuff that goes onto the base, variously termed in English lipstick, mascara, eyeliner, and many more. Color makeup seems to be a common choice. We were warned not to use the Japanese terms unthinkingly, but to shop around. A reputable site with reams of terms to apply is Linda Mason Agency lindamason.com/index2.htm and Allure Magazine is also a reliable port of call for the nuances that may be lost in the two-headed Japanese approach. “Leaf Pie,” a common treat around here, apparently gets across fine in English. Inspired by a thread seeking assurance in this, a lister had found a cornucopia of leaf pie-related information at Google Images; this page will thrill the sweet toothed, visually inspired, and maybe others too. Speaking of net addresses, there was a thread about landing pages (the page where you arrive at a site in your perambulations on the Internet), which led to a discussion of how links to popular parts of the SWET site are not intuitively available. One reason that certain content indicated on the site is not accessible is that copyright is taken seriously, and copyright has not been secured from writers who are difficult to find. To make more of the resources of SWET available online, more work has to be done, and in true SWET fashion we were then asked to volunteer to help out. Helping out with the tasks of enhancing the website’s value is a fine way to get to know the inner workings of SWET. The webmaster or the newsletter coordinator will respond to offers for volunteer assistance. A thread noted that the Japanese language comfortably represents the dialogue of robots or aliens using kanji and katakana, but what notation can we adopt for English? Not so easy, the response was; and judicious choice of fonts may offer one solution. But “wide show”? Getting that across will take, maybe, “TV gossip show” to fill the bill. Still the source of the query was not quite happy about this or the “tabloid talk,” also offered up. So ends another installment in the fukubukoro grab bag (福袋) that SWET-L offers all year round, battling the changing ways of our rampaging English ever eager for anchoring and elucidation. Points of English style and grammar, handling Japanese words in English (Noh? noh? nō, or No? ), dictionaries, style manuals, and other reference sources for wordsmiths, knotty ethical questions, electronic writing and publishing tools, dealing with clients, getting work, job offers (especially in Japan), getting qualified, professional networking. Getting and giving information—the SWET mailing list and online discussion group SWET-L started in October 1996. A column digesting the major threads of discussion for readers of the SWET newsletter was begun in 2001 by Holly Ueda as “Threads on SWET-L.” Taken over in 2005 by Torkil Christensen, it continued until 2011. In 2008, the column title was changed to SWET Cyber Matters.